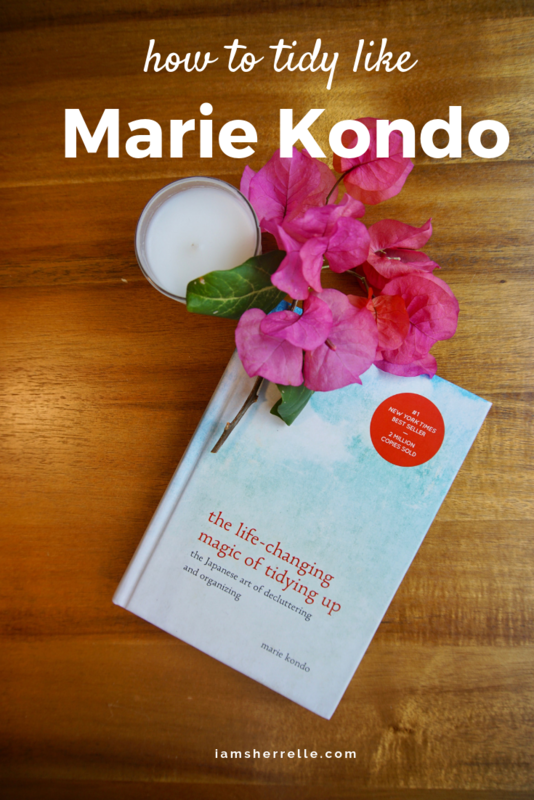 Years ago when it was first released, I bought the book The Life-Changing Magic Art of Tidying Up by Marie Kondo for my family to read. They didn’t read it. I didn’t read it because, well I didn’t need to; I was already quite organized, thank you very much. When I saw that there was a Netflix series Tidying Up With Marie Kondo I thought “Perfect! They will watch anything on Netflix!” So recently one Friday night we all snuggled on the sofa to watch, with me only mildly interested because this was really for them. They fell asleep. I binge-watched the whole series alone. The next day I read the book. And now, I’m hooked. Turns out that I didn’t know anything at all. Yes, I am good at purging – we’ve moved enough times that I have a pretty low tolerance for random stuff. We live in a small house with minimal storage so most everything in my home is organized. I know my way around the Container Store. But Marie Kondo taught me that a tidy home is less about how you organize and more so about the why. The containers are less important than what’s in them. And what’s in them should evoke a feeling of joy and gratitude. Her approach is very zen. Yet also sensible. As my friend Andrea says, it’s Zensible. The KonMari Method of tidying your home is by category (not by room) and in this order: clothes, books, papers, komono (miscellany) and sentimental value. Marie instructs her clients to begin each category by piling all the items into one big pile. I’m pretty sure this is for shock value because most people aren’t aware of just how many clothes/books/papers/photos they have until they are pulled from all the different parts of the house and in a pile. I think that “holy crap” moment jumpstarts people into action. Then – and this is key – you most hold each item and ask yourself if it “sparks joy” before deciding to keep it or discard it. Not if it fits or still in style or if you’ve worn it in two years – all the traditional barometers of organization – but if it makes you feel joyful. The feeling of joy is key; that’s why you have to touch the item. If you are confused about what “sparking joy” means, you must watch Marie demonstrate on the series; she is truly delightful to watch. If the answer is yes, the item sparks joy, you put it in the keep pile. If the answer is no then you must thank the item before putting it in the discard pile (“thank you sweater for keeping me warm” or “thank you college t-shirt for holding up with limited washings in those college years”). I absolutely love this act of gratitude! Just because we no longer desire an item doesn’t mean that it didn’t serve us at some point. I have a small closet so I do not/can not have many clothes. I’m also at an age where I will only buy clothes that fit me well and that reflect my particular sense of style. Still, I followed Marie’s way and held each item in my hands and sure enough, there were items hanging in my closet that did not bring me joy. By the end I had filled one large trash bag – and this is after I had already purged my closet (or so I thought) a few a days into the new year. Marie has a very specific way of folding clothes. Already my t-shirts were folded that way, but now I folded all my clothes in the KonMari Method – even my socks. If I got stumped I searched “Marie Kondo folding” on Youtube; there are many tutorials. 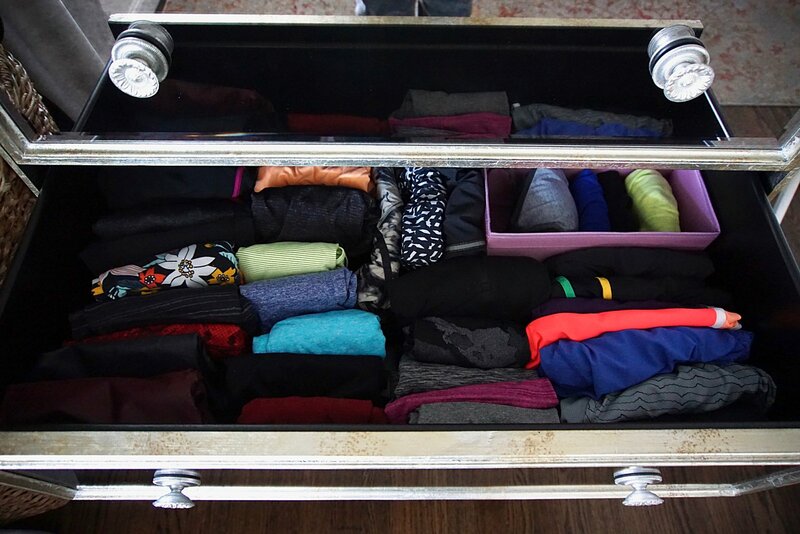 My drawer of exercise clothes. They work hard and deserve respect. I really really hope that my husband tackles his own clothes using the KonMari Method because his closet is bursting. My husband, like a great deal of men, has an abundance of t-shirts. For him these are often t-shirts that he has gotten for free at a conference. I seriously doubt that these conference shirts spark joy! It’s a problem. I believe that a person only needs so many of what I call “washing the car” t-shirts. Maybe 4 at the most. Because how often do you wash the car? Once a week? Except for my husband; he washes the car…..never. Nor does he do any other sort of manual labor. Dude, the t-shirts need to go. I think discarding books is hard for most people. “I might read this book one day” or “I will most certainly read this book again” are common excuses against discarding books. For some people books can be a status symbol of a cultured and well read home. I do know some people, mostly writers, who do get great joy from books and would never ever think of throwing one away; it would be like throwing away a friend. But I think most people do not fall into that category. We when we moved two years ago I gave several boxes of books to the local library. At the time my thought was that I wanted to simplify my life and put books on my iPad/Kindle app instead. That worked for awhile but two years later we have more books – books that people gave us, books that we “might” read one day, books on the bestseller list that we “must” read – in other words, not books that spark joy. Do you have a Little Free Libary in your neighborhood? These lovely little book stations make it easier for me to discard books if I feel that someone else may enjoy them. Marie says that books that belong in your personal Hall Of Fame are absolutely books that shall remain. For me that is all the Harry Potter books, Tina Fey’s Bossypants and Elizabeth Gilbert’s Big Magic. 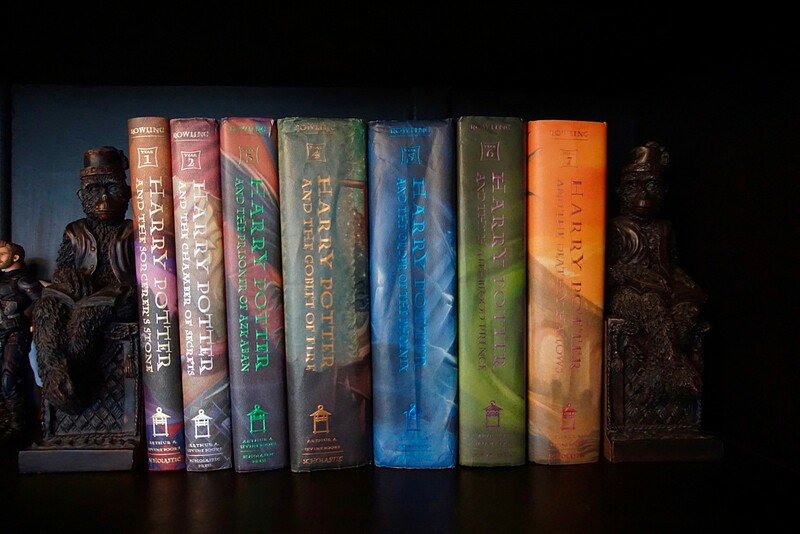 I do indeed re-read Big Magic every year, I love Tina Fey and I am a true Harry Potter fan. Most of us can identify those books in our library. The more difficult books are the ones that only bring moderate pleasure: books that we have read and enjoyed at the time but were forgettable and honestly we have no intention of reading again. I have to admit that I still have a problem with this category of books and have some work to do! We live in a digital world and you would be hard-pressed to make a case for keeping boxes and boxes of papers. I’m pretty good in this area; we have one file box that I purge every January and one box of old tax returns and receipts. I put magazines and catalogs into the recycling bin as soon as I finish reading them and I open mail right away. If it’s something that I need later, like a bill to be paid or an insurance claim, I put it in the paper tray. If it’s something to file away, like the DMV smog certificate or new life insurance papers, I file it right away. The rest goes into recycling. Just like Marie says all of these papers live in one spot; in a deep kitchen drawer. I will give myself a KonMari high-five around tidying papers. In my house it’s a box of electronic cords. We have no idea what they belong to but keep it “just in case.” That was put to the test Christmas Eve when we decided to watch old home movies. We needed a cable to feed the camcorder to the tv and pulled out the box of cords. We found the cable, but our tv is too advanced for the old cable so it didn’t work. Why are we saving these cords again? Personally it’s my collection of jewelry. I wear about 5 necklaces consistently and these I love but the rest I keep “just in case” I will wear them – even though they are no longer my style. Some of them are gifts and I feel that I “must” keep them. Marie has something to say about gifts: gifts are not things but a means of conveying someone’s feelings. The act of giving (whatever it is) is the gift. And once you receive the gift with gratitude the sentiment is complete. Ideally we would love and use the gift but if that isn’t the case we shouldn’t feel any guilt about passing it on to someone who does love it. Lastly Marie has her clients tackle sentimental items. As you can imagine, this is tricky and very hard for most people. This is where the kinda sorta hoarders tend to hang their hat. This is my son. When we moved a few years ago my son was away at college. He is a packrat (just a cute word for hoarder) and keeps everything – he had several boxes of childhood memories. We were moving from a house with a garage with ample storage space to a townhouse with practically no storage; we had no room for extreme sentimentality. I commanded my family to pare down their sentimental keepsakes to one storage box each. Since my son was not at home I face-timed him and went through each of his keepsake boxes item by item. It was extremely painful and took forever because he fought to keep every item. He tried to make a plea for a Candyland board game that was falling apart. I reminded him that they still make Candyland but he said “this is the one I played with.” I don’t know if I convinced him or if I just threw it away myself but the line had to be drawn somewhere. With much effort I managed to cram his sentimental items into one storage box and guess what – years later he’s never looked at it. He has no idea what’s in there and I bet he really doesn’t care. Besides the one storage box allowed (with my high school year book, beauty pageant program, girl scout sash, and sorority memorabilia) I only have a few other sentimental items. Some jewelry of my grandmother’s that is tucked away in a box and a small crystal pitcher from my great grandmother that I use as a gravy boat during holidays. I have one box of my daughter’s most special baby clothes and shoes wrapped in acid-free paper. A friend once told me that she wore her mother’s clothes as a baby and I thought that was a lovely idea. I am keeping these for future grandchildren. I do still have my wedding dress boxed and stored at my parent’s house (a Marie Kondo no-no! – we are not supposed to burden our parents with our things) and I have no guarantee that my daughter will wear it. But that’s as sentimental as I get. I think it’s pretty good. I’m keeping the wedding dress. 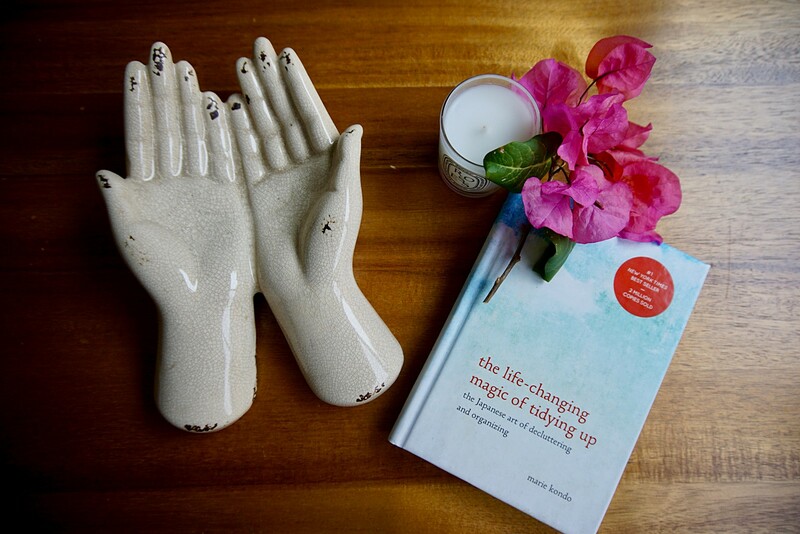 Although Marie Kondo’s KonMari Method is centered around tidying and you should definitely start there, I believe the attitude of joy and gratitude should extend to decorating your home. The last few years I have taken that approach (without the teachings of Marie Kondo). No longer do I allow random decorative objects and art to adorn my surfaces and walls; I will only display items that bring me joy. 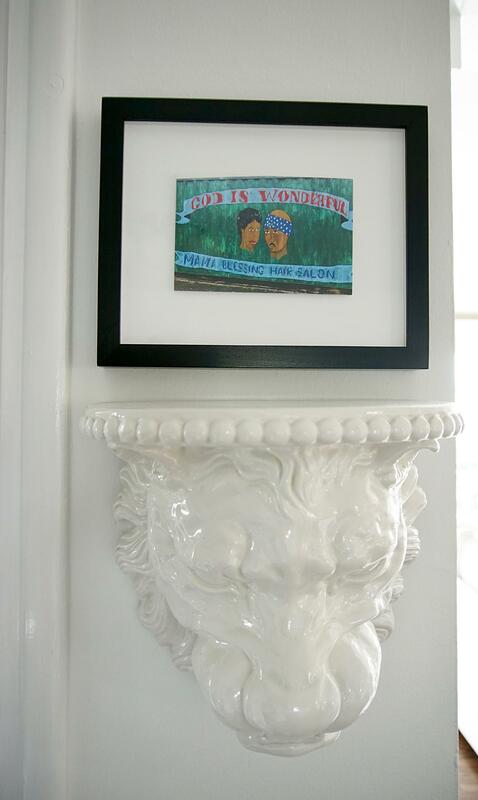 Armed with that resolve and the book Styled by Emily Henderson I decorated our latest home. We have a big white sectional sofa, a glass and cooper coffee table and a white marble dining table. It’s grown-up furniture. But the art and decorative objects is where I have some fun and showcase my whimsical personality. Most of all, the objects decorating my home bring me joy. Here are some of my favorite things. My daughter and I found these coyote teeth on our street. They did not look like this when we found them – they were gruesome and grizzly with bits of coyote still attached. The coyote’s nose was nearby; we left that alone (although we did get look). We were fascinated: what happened to only leave behind the coyote’s mouth and nose? Where was the rest of the body? We decided to keep the teeth. Through the teachings of Google I learned how to clean them (a very long and not so pleasant job) and finally put them on display. I love that my daughter shares my joy in curiosity (“What’s that on the ground?”) and wonder (“Coyote teeth; what a cool thing to find!”). Behind the coyote teeth is a piece of art that I bought at an art show last year. 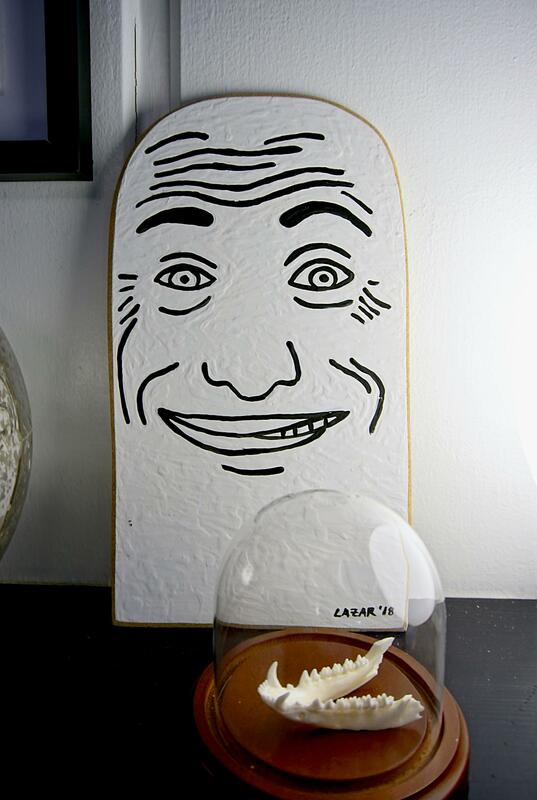 If you can’t tell, it’s a thumb with a face drawn on it. My daughter named him Clarence. The minute she named him I had to buy it. I found this lion head shelf in a vintage store for $20. I love lions so there you go, that’s the only explanation needed. The frame above it is a postcard that I bought in an artist’s shop in a South African township. It’s a drawing of beauty salon and the guy looks like Tupac. That was reason enough. I had been looking for a box for the tv remotes but couldn’t find one I liked or that was the right size. On vacation in Havana, Cuba we ate dinner at one of Havana’s best restaurants, La Guardia. After a lovely meal in the most charming setting the waiter brought the check in a wooden box. I had an instant thought: this is the perfect size for the tv remotes; it’s the box I have been looking for! I asked if I could buy it and after some negotiation we settled on a price. Now my favorite souvenir sits on the coffee table on full display. It’s useful, beautiful and reminds me of that magical night in Havana. I love cartoons and superheroes. 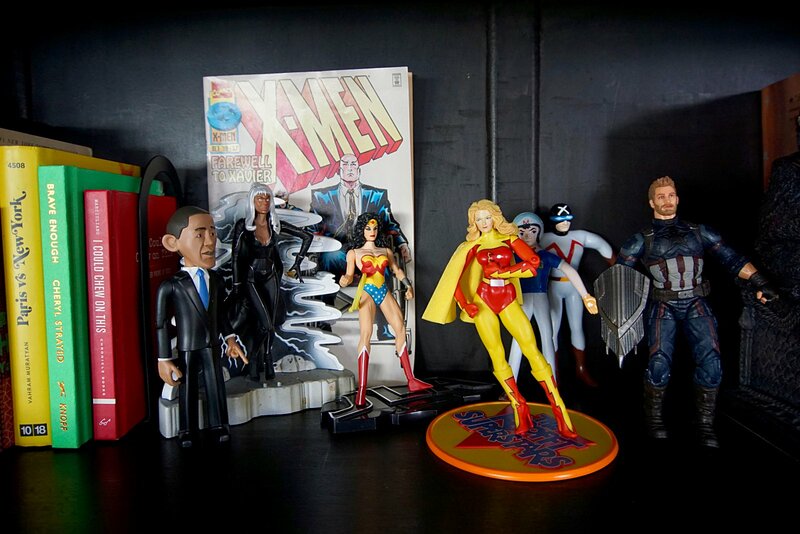 This display of action figures alongside serious books makes my heart smile (and yes Barak Obama falls into the category of a superhero). 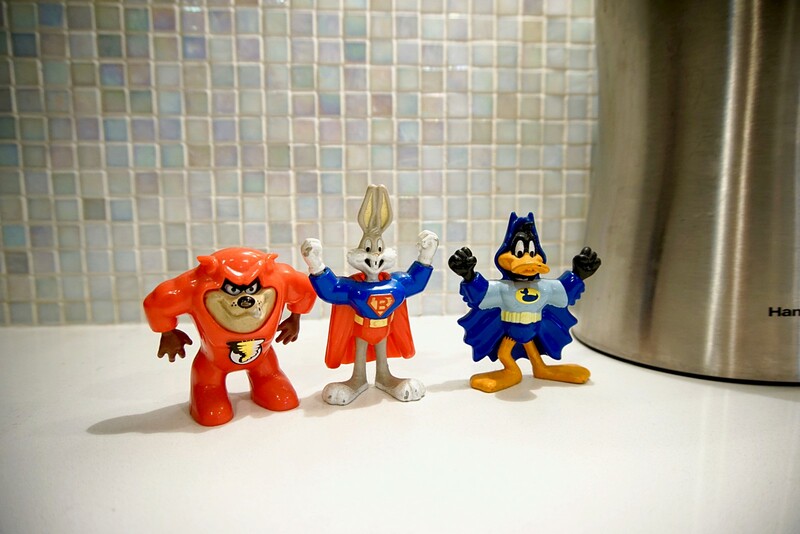 I don’t know how long I’ve had this trio of Looney Tunes superheroes – at least 25 years – but I plan on keeping them forever. They are on the kitchen counter next to the tea kettle and I see them everyday when I make my bulletproof matcha. I have many beautiful photos of our vacations in Paris – of the Louvre, Eiffel Tower, Seine – but this photo of a very ordinary Jack Russel Terrier is my favorite. My daughter and I spent an afternoon in Place des Vosges and saw this dog watching from the outside while his owners played in the sandbox. He sat there obediently, off-leash, for over an hour watching through the iron gate. When we left we saw why he was on the outside – dogs are not allowed inside the park. This from a city where I’ve tripped over a giant Labrador Retriever inside a posh restaurant. 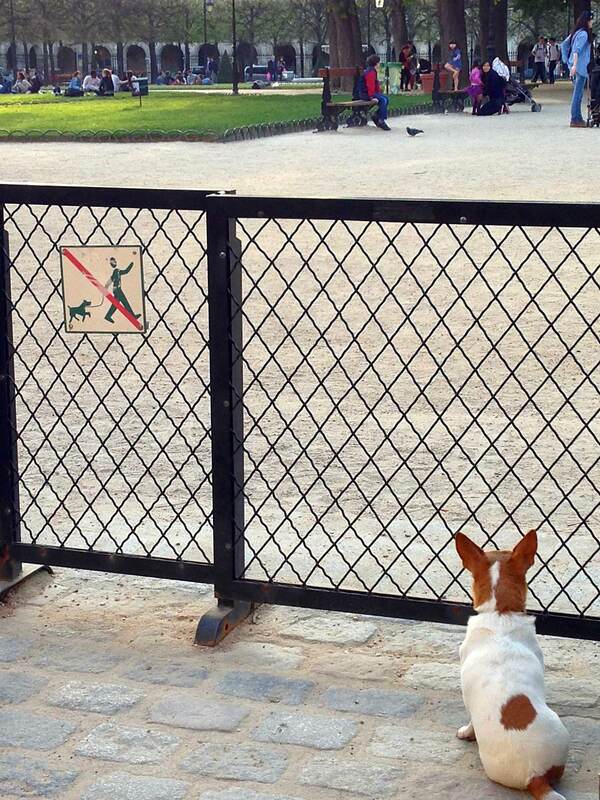 We thought this was hilarious and such the paradox of Paris – dogs in restaurants, yes, dogs in parks, no. It is framed as art on the wall because it gives us so much joy recalling that day and that dog. I got a surprise the other day – my daughter is reading the book! She likes it. I think the zen approach resonates with her. I just hope it translates into tidying her room. P.S. You might also enjoy reading about how I designed my very own she-shed.